If you remove a Euc as we call them here at Greene Tree Care for whatever reason, be sure to have the root system thoroughly ground out as it will rejuvenate rather rapidly and you will have to repeat the whole process again. Eucs are survivors! They are native to Australia, but have adapted to climates all over the world. These trees have a shallow root system, which developed as a way to survive in a harsh native environment, where accessing a limited amount of rainfall is crucial to survival. It’s this shallow root system that can make eucalyptus trees a danger. About 90 percent of a eucalyptus tree’s roots grow in the top 12 inches of soil. This shallow root system grows rapidly, and along with a strong taproot, the lateral roots are vital to keeping a eucalyptus tree upright. A eucalyptus tree’s taproot must grow down into the soil at least 6 feet to ensure good anchorage. The lateral roots spread out for up to 100 feet to help support the rest of the tree, and this can be an issue for nearby buildings and structures. The roots and rootlets of eucalyptus trees planted in a yard can grow into ditches, clog water pipes, and crack septic tanks and cisterns. The roots of eucalyptus trees planted in an urban environment can damage sidewalks, curbs and gutters. As the shallow eucalyptus roots grow and produce secondary thickening growth, they can heave up paved surfaces above and around them. 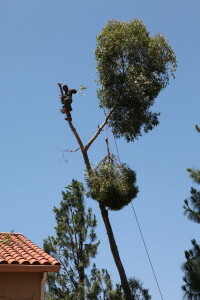 In exposed locations, where eucalyptus trees are subjected to strong winds, a shallow root system presents a hazard to people, homes and other structures. If the root system is not well established, winds can cause the tree to sway, which loosens the soil around the root collar. This causes the shallow roots to tear and the tree may fall over. Newly planted eucalyptus will show a cone-shaped hole around the base where the soil is lost around the root collar, which indicates the tree is at risk of uprooting. If you choose to plant eucalyptus trees, you can limit some of the dangers associated with its shallow root system with proper planting and maintenance. Plant eucalyptus trees so the distance away from buildings, structures and roadways is equal to two-thirds the potential mature height of the tree. If you plant your tree in clay soil, plant it further away because clay soils shrink when dry, increasing the risk of uprooting. Coppice the tree regularly to restrict growth, particularly when it grows too tall, is top-heavy or unstable. Coppicing is the process of cutting a tree down to allow the stump to regenerate. Eucalyptus roots grow rapidly, and coppicing serves to reduce the overall size of the tree, and restricts root and branch growth by stopping the food supply of the tree temporarily. This prevents the tree from storing up nutrients to build a bigger root system.